If you have ever spent time in Dumbarton Oaks' gardens you know what it feels like to be surrounded by beautiful trees. This well-kept, historic landscape is the only place I go to see the cherry blossoms because I can avoid the crowds and enjoy the many other stunning trees just awakening from their winter slumber. Among these natural treasures is a American Beech (Fagus grandifolia) that stands in the middle of its own outdoor room appropriately named the Beech Terrace. 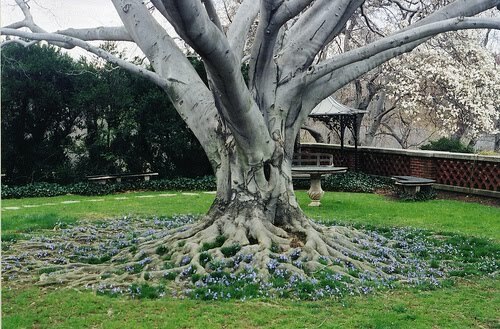 While not the original beech tree the terrace was designed around in the 1920's - the original, a Riversii, was removed in 1948 after a period of decline - this American Beech has flourished in its surroundings and certainly makes Dumbarton Oaks a year round destination. At 49.5 inches in diameter at breast height, its canopy spans the terrace. It has a smooth, light gray bark and long pointed buds, and when in leaf, makes the dappled sunlight dance across the ground. The exposed shallow roots are simply amazing. They rise above the ground, overlapping each other, creating a textured, lacelike pattern. The only thing more compelling than the beauty of this American beech is the sense of place you get when you are nestled under its canopy. Because the tree was planted in the center of the terrace, its branches create a living ceiling that changes with the seasons. No matter the time of year, this tree hugs you back.